Winner of 5 Academy Awards®, Kramer vs. Kramer is a ground-breaking drama about the heartbreak of divorce and the struggle between work and family. Young husband and father Ted Kramer (Dustin Hoffman) loves his family - and his job, which is where he spends most of his time. When he returns home late one evening from work, his wife Joanna (Meryl Streep) confronts him and then leaves him, forcing Ted to become the sole caregiver to their six-year-old son. Now, Ted must learn to be a father while balancing the demands of his high-pressure career. But just as Ted adapts to his new role and begins to feel like a fulfilled parent, Joanna returns. And now she wants her son back. Awards: Won for Best Picture; Best Director; Best Actor-Dustin Hoffman; Best Supporting Actress-Meryl Streep; Best Screenplay. Nominated for Best Supporting Actor-Justin Henry; Best Supporting Actress-Jane Alexander; Best Cinematography; Best Film Editing. 1980. DVD: Widescreen 1.85:1/16x9; audio English Monaural, French Monaural; subtitles English, Spanish, French, Portuguese, Chinese, Korean, Thai; closed-captioned; single sided - dual layered; 28 chapters; rated PG; 105 min. ; $24.95; street date 8/28/01. Supplements: “Finding the Truth: The Making of Kramer Vs. Kramer”; Theatrical Trailers; Filmographies; Production Notes. In August 2001, four winners of the Best Picture Oscar hit DVD, but not all were treated equally well. Clearly 1994’s Forrest Gump received the most attention. It’s the newest of the four, and it also earned the most money; its $329 million places it sixth on the list of all-time top grossing movies. By comparison, the others kind of seemed lost in the shuffle, though 1982’s Gandhi stood out somewhat because of its epic scale. On the other hand, the final two BP winners were much smaller efforts, and since they hit movie screens in rapid succession, they may get lumped in together. 1980’s Ordinary People appeared on DVD shelves first; it was released on August 14, while the others had to wait an additional two weeks. Its immediate predecessor was 1979’s Kramer Vs. Kramer, and it seemed likely to be ignored. However, hopefully that won’t be the case, for one can definitely argue that Kramer was the best film of the four. Ironically, however, I’m not sure it was the finest movie produced in 1979. Francis Coppola’s Apocalypse Now seems to stand as that year’s crowning achievement, though not many saw it as such during the period. I recall that it received many lukewarm reviews, and it took years for the movie to attain its current regard. Conversely, Kramer has largely faded from view. It may be seen as a remnant of its era and it rarely comes up in discussions of classic films. As I’ve noted in other reviews, Oscar does tend to prefer his period pieces, which is what made the Seventies an unusual time. From 1971 to 1980, a whopping six of the 10 BP winners took place in then-contemporary settings. Even the films with older settings didn’t always stray far from home. For example, 1978’s The Deer Hunter used the very-recent past, and parts of 1974’s The Godfather Part II went back only a couple of decades. Only 1973’s The Sting and 1972’s The Godfather were firmly set in long-gone eras. Contrast that with 1961-1970, with three contemporary films (1961’s West Side Story, 1967’s In the Heat of the Night, and 1969’s Midnight Cowboy) and 1981-1990, with only two then-current settings (1983’s Terms Of Endearment and 1988’s Rain Man). The next decade fared no better; from 1991-2000, we found only two more contemporary flicks (1991’s The Silence of the Lambs and 1999’s American Beauty). I guess the Academy was a little more adventurous in the Seventies, but I can somewhat understand Oscar’s preference for period fare. Movies with then-current settings can much more easily suffer from the wear and tear of aging, as they don’t always stand up very well past their eras. Look at older flicks like Gentleman’s Agreement or The Lost Weekend; these seem quite dated by now. Happily, Kramer largely avoids those traps, mainly because it has little to do specifically with its era. The movie revolves around the family of husband Ted (Dustin Hoffman), wife Joanna (Meryl Streep) and son Billy (Justin Henry). At the start of the film, Joanna abandons the other two; she seems to be on the verge of a nervous breakdown, and she no longer loves Ted enough to remain with him. Ted’s a go-go advertising man, and his work clearly consumes his life. As such, he’s not developed much of a connection with Billy, but he now needs to get a crash course in parenting. Much of the film follows the evolution of their relationship, as we see Ted go from helpless and distant to controlled and loving. Though things eventually go well between father and son, dark clouds loom when Joanna reenters the picture after 15 months away from them. She becomes determined to regain custody of her son, and that sets up a furious battle between her and Ted, who feels equally resolute. As I mentioned, Apocalypse Now remains my pick for the best film of 1979. It offers a much more ambitious and epic form than does Kramer, though it also falls short of many of its goals; the last third of Apocalypse still borders on unwatchability. Kramer shoots lower but hits more consistently. In some eyes, that may make it superior, but I’ll take the greater aim of Apocalypse. Nonetheless, I did find Kramer to be a surprisingly compelling piece of work. For reasons unclear to me, I went into it with a modestly negative mindset. I’d seen it before, but it’s been many years, so that prior experience doesn’t count for much. Perhaps I retained the memory of the film’s most famous scene, the one in which Billy disobeys his father and eats ice cream; out of context, that segments seems awfully cute and cloying, and I may have feared the whole film would work in such a way. Happily, it didn’t. Instead, we got a fairly engrossing examination of the developing bond between father and son, and the movie convincingly depicted the strain put on a single parent, especially one with so little experience. Actually, I thought much of Kramer reminded me of the Jim Carrey comedy Liar Liar, which also featured a crummy father who learned to appreciate his son. Of course, the latter went for a wilder tone, but I felt some similarities existed. Both Hoffman and Streep won Oscars for their work in Kramer, and costars Henry and Jane Alexander - as a friend of Ted and Joanna’s - both received nominations as well. I don’t know how much I agree with the awards, at least in the case of Hoffman. Streep received fairly little screen time, but she made the most of it; you feel as though Joanna plays a much stronger role than she actually does. Streep’s work here doesn’t match up with stellar performances like that of Sophie’s Choice - for which she won another Oscar - but she did make Joanna a much more prominent and memorable character than otherwise might have been likely. As for Hoffman, I must admit I’ve never been a great fan of his work. To be sure, I like him to a degree, but I’ve always found his performances to contain a showy element that made them seem moderately forced. The same elements emerged during Kramer, particularly in the earliest scenes. Hoffman tried to so hard to compress all of the aspects of Ted’s personality into little balls that I felt it didn’t flow naturally. His work improved as the movie progressed, however, and I thought he got more deeply within the character’s skin. Speaking of Hoffman, as an aside I was interested to note his unusual string of Best Picture winners. For three straight decades, he started in an Oscar-winning flick about every ten years: 1969’s Midnight Cowboy, 1979’s Kramer, and 1988’s Rain Man. Too bad 1999’s The Messenger had to break his run! As a whole I thought Kramer Vs. Kramer offered a fairly satisfying drama. It took a rich and honest look at the collapse of a relationship and a father’s bond with his son. Overall it provided a well-executed piece of work that delivered an interesting experience. 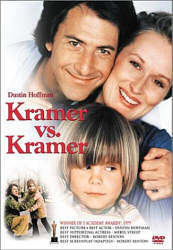 Kramer Vs. Kramer appears in an aspect ratio of approximately 1.85:1 on this single-sided, dual-layered DVD; the image has been enhanced for 16X9 televisions. Though it displayed some modest concerns, for the most part I thought this was a pretty solid presentation. Sharpness consistently appeared crisp and accurate. I detected very few soft or fuzzy images, as the movie came across as distinct and well-defined. Some mild moiré effects cropped up at times, though, and I also saw minor edge enhancement on occasion. Print flaws seemed to be rather minor for a somewhat older movie. The main problem stemmed from light grain that intruded upon many scenes. However, since virtually all of the grain appeared in low-light sequences, I’m pretty certain it came from the source material and always accompanied the film; I don’t believe it was a concern attached to the new transfer alone. Otherwise, I saw occasional examples of speckles and grit, but these were quite minor. As a low-key drama, Kramer didn’t feature a bright palette, and the colors remained consistently subdued throughout the movie. That said, I thought they appeared acceptably accurate and concise. While the tones were dull, that seemed to be intentional, and I felt the image replicated the hues appropriately. Black levels looked a little drab but usually were reasonably deep and dense, while shadow detail could seem mildly thick. In general, the interior shots - of which the movie largely consisted - came across as a bit murky, while exteriors looked very positive. Nonetheless, I felt that Kramer Vs. Kramer provided a generally solid image that betrayed few real problems. Less exciting - though still not bad - was the monaural soundtrack of Kramer Vs. Kramer. Given the film’s quiet demeanor, it should surprise no one that this was an unassuming mix. Speech sounded distinct and accurate, with no signs of edginess or problems related to intelligibility, but the lines remained somewhat thin and lifeless. The same qualities affected effects, which were clean and without problems but they seemed flat and drab. Music showed modest range, as some of the minimalist score offered reasonable warmth, but these elements generally seemed bland as well. Ultimately, Kramer offered a listenable but unexciting experience. Although it doesn’t provide a wealth of extras, Kramer tosses in a few goodies. Easily the most significant supplement was a brand-new documentary called Finding the Truth: The Making of Kramer Vs. Kramer. This 48-minute and 20-second program combined film clips, stills from the set, and new interviews with writer/director Robert Benton, producer Stanley Jaffe, author Avery Corman, and actors Dustin Hoffman, Meryl Streep, Jane Alexander, and Justin Henry. Those latter elements were what made “Truth” truly special. The interviews went far beyond the usual “he’s great, she’s great, we’re great” nonsense found during most pieces of this sort. Instead, we learned a great deal about the production, from its genesis to the production to fine notes about the characters. While all of the participants were compelling, I must give special appreciation to Hoffman, who provided a wealth of honest and fascinating details about his work. He and Streep remain two of the most noted actors alive, and it was fantastic to hear them talk about their performances. Since Hoffman played a much bigger role in Kramer, he dominated the documentary, and that was fine with me; I can’t recall the last time I heard such an engrossing discussion. Across the board, “Finding the Truth” was a wonderful documentary that added immensely to my appreciation of the film. In addition, the DVD included some of the old stand-bys. It provided Filmographies for Benton plus actors Hoffman, Streep, Alexander and Henry. Some short but solid Production Notes appeared in the booklet, and we also got trailers for Kramer plus fellow Hoffman vehicles Hook and Hero. While I don’t believe that Kramer Vs. Kramer was the best film of 1979, it did provide a reasonably engaging and vivid experience. The movie offered generally solid acting and an involving and believable story. As for the DVD, its image seemed quite good, while the sound was drab but serviceable. Only one substantial extra appeared, but it was absolutely terrific. Ultimately Kramer Vs. Kramer merits your attention as a well-made drama.